This is the third of four blogs about the re-discovered George Caleb Bingham portraits of William Franklin Dunnica and Martha Jane Shackelford Dunnica. Given in Memory of Maurice Bloch and of Blake Nevius, friends of the artist. Over the years, Category D. has become the kiss of death. Each painting listed there that I have personally seen reinforced Bloch’s classification. But the Dunnica portraits were easily recognizable Binghams with impeccable provenance. Art historical documentation and connoisseurship solidified the authentication. 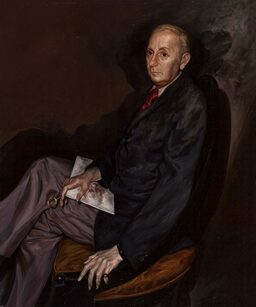 How could Bloch have relegated such fine portraits to the dustbin of his catalogue? How Did This Mistake Happen? The short answer is: he never saw the Dunnica portraits. The long answer is found in a close reading of Bloch’s explanatory notes. I, too, found Shackelford descendants when I reviewed Bloch’s work. They generously sent me a color photograph of their portrait of Martha Jane, which I had only known through the black & white photograph in the Catalogue Raisonné. At first glance, the previously known portrait of Martha Jane Shackelford Dunnica does not appear to be the same woman pictured in the head & shoulders companion portrait of her husband. But, on close examination, it can be seen that the hairline and ears are identical; the mouths and shoulder shapes are similar; and the sitter is wearing the same necklace in both portraits. 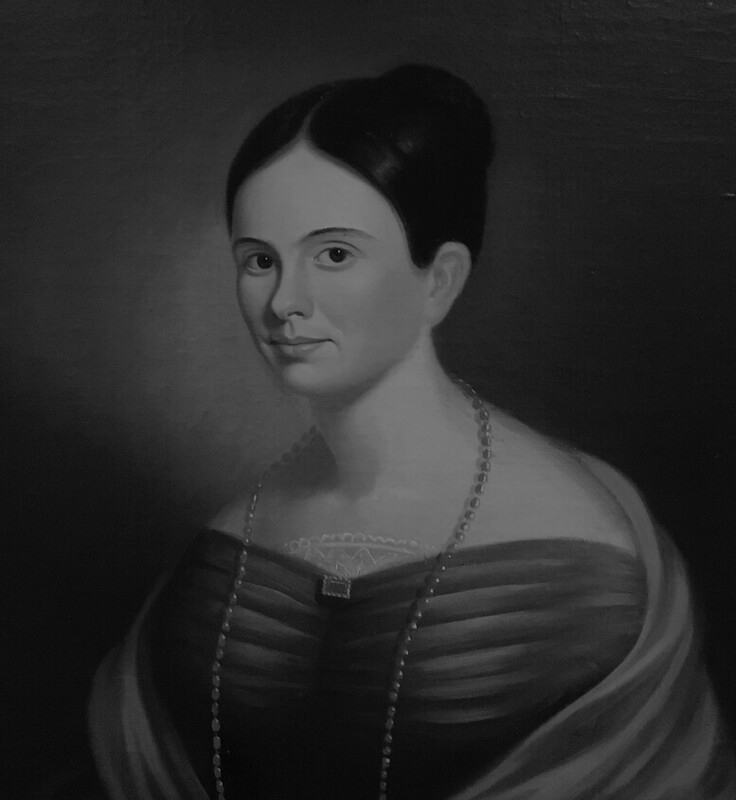 I scrolled through my portrait image collection for 1836-1839 and could not find another necklace like it. The differences in the two portraits lay in Bingham’s increasing talent. In the later, and larger, portrait, Bingham knew to pose the head so that the nose was less prominent. The nostrils are alike. The most striking difference is the eyes. The artist had learned how to better shape and shadow eyes. 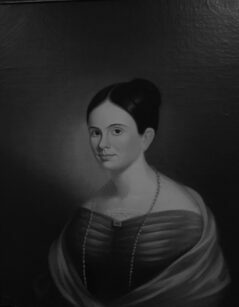 Since Bloch had seen the later portrait of Martha Jane Shackelford Dunnica, he logically assumed that the paintings listed in Rusk were of Dunnica and his second wife, Leona Hardeman Cordell (1807-1896). 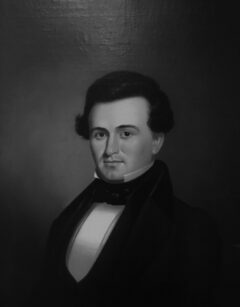 He further presumed that the companion portraits were painted near the second wedding date, June 1860. Since the Shackelford family had no knowledge of the other portraits, he concluded, “Evidently attributed to the artist by family tradition, with no substantiation.” With such reasoning, he classified the portraits of Mr. and Mrs. William Franklin Dunnica in his Bingham Catalogue Raisonné in Section D: Attributed Paintings, without ever seeing them. 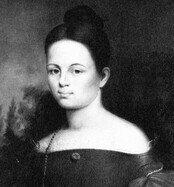 In updating E. Maurice Bloch’s The Paintings of George Caleb Bingham: A Catalogue Raisonné, the re-discovered portraits of William Franklin Dunnica and Martha Jane Shackelford (Mrs. William Franklin Dunnica) should be listed in Category A., with a date of execution of 1836-1837, with their impeccable provenance, and expanded biographies. A fine addition to a well-researched, awe-inspiring volume that is almost perfect due to the efforts of an outstanding art historian, E. Maurice Bloch. In the fourth and final blog, the stories behind the Dunnica portraits provide a window into the past that brings history to life through the details of the sitters’ lives. [i] David Rodes and Anthony Vidler, “E. Maurice Bloch, Art History: Los Angeles,” calisphere.org, http://texts.cdlib.org/view?docId=hb5g50061q;NAAN=13030&doc.view=frames&chunk.id=div00015&toc.depth=1&toc.id=&brand=calisphere, accessed January 2019; E. Maurice Bloch’s books on George Caleb Bingham are: The Paintings of George Caleb Bingham : A Catalogue Raisonné (Columbia, MO : University of Missouri Press, 1986, The Drawings of George Caleb Bingham, with a Catalogue Raisonné (University of Missouri Press, 1975); George Caleb Bingham: The Evolution of an Artist (Berkeley, CA : University of California Press, 1967); and, George Caleb Bingham: A Catalogue Raisonné (Berkeley, CA : University of California Press, 1967). The latter two works expand on the earlier books, but the original texts still contain valuable information about the Missouri Artist. [ii] E. Maurice Bloch, The Paintings of George Caleb Bingham: A Catalogue Raisonné (University of Missouri Press, 1986), page 263. This entry was posted in Professional Art Research, Rediscovered George Caleb Bingham Portrait and tagged Bingham Catalog Raisonne, E. Maurice Bloch, George Caleb Bingham Catalogue Raisonne, Mary Jane Shackelford, William Franklin Dunnica. Bookmark the permalink.